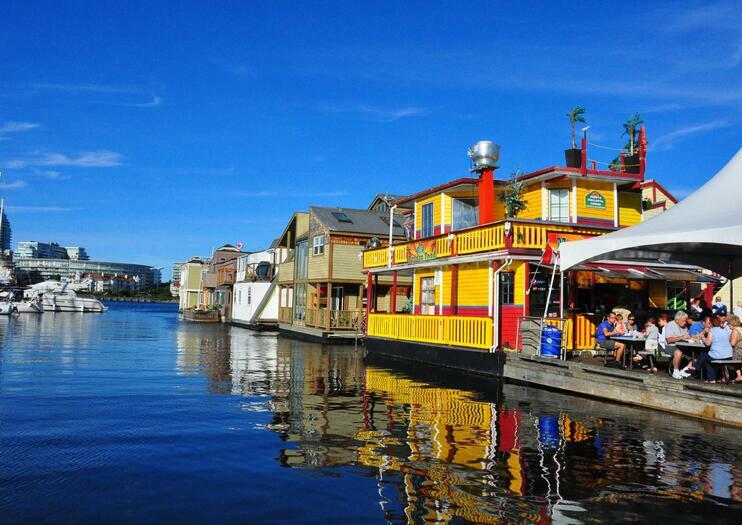 Fisherman’s Wharf is an eclectic combination of tourist shops and residential float homes. Although the fishing heyday has passed, at which time when a fishing vessel was tied to every slip at the Fisherman’s Wharf except the two “live aboard” docks, the atmosphere hasn’t changed much. Colorful characters still roam the docks, but now often rub shoulders with passing tourists rather than sea-hardened fishermen. The live aboard homes have been transformed into beautiful float houses, each as eclectic as the last and proudly carrying its own décor and charm. Seals are a near constant at the dock and they receive more than their share of bait from the local fish stores that aim to keep tourists happy and registers ringing. The small collection of shops includes an ice cream shop, BBQ grill, fish and chips stand, and a coffee house, alongside an excellent Fish Market and Crab Sales. There’s also some outgoing tourism, as whale watching and sea kayaking tours kick off from Fisherman’s Wharf and head out to sea through the harbor. Fisherman’s Wharf is located at 1 Dallas Road. It is a 10-minute walk along the inner harbor to the BC Legislature Buildings. Between May and September, water taxis operate in the harbor, with stops throughout downtown and at Fisherman’s Wharf.